What about infrared Sauna vs Traditional Sauna? Whether you are considering adding a sauna to your home or outdoor recreational area, or just curious about saunas in general, there are some things you should know about the difference in traditional saunas versus infrared saunas. Generally, both are meant to perform the same function, which is to create heat which will enable you to sweat and, hopefully, relax. They both go about it in different ways, though, and here are some details about each one. The first thing you may notice when comparing infrared sauna vs traditional sauna is the absence of steam, coals or hot rocks. Infrared saunas use built-in infrared heaters to create the warmth. These heaters are traditionally located at the top and in the sides of the sauna and, unlike coals, are not hot to the touch. Traditional saunas need more time to heat up, while infrared saunas emit warmth that penetrates the skin, muscles and even joints, but does not usually become as noticeably hot. Most users compare it to basking in warm sunlight. The heat is absorbed into the body while traditional saunas heat the body indirectly by steam or air. The idea is, traditional saunas tend to heat the room and therefore the body in it. Infrared saunas heat the body directly. Some feel the dry, radiant heat is a much more enjoyable alternative to the damp, humid heat of a traditional sauna. One other reason people prefer infrared sauna vs traditional sauna is that there are no mold or mildew issues, as there can be with traditional saunas. Many people, including some doctors, feel the lack of dampness and possible mold or mildew means a safer, cleaner, healthier sauna. Because of the extra cleaning required, as well as other factors, the maintenance for standard saunas is usually much more extensive than for the infrared version. Comparing infrared sauna vs traditional sauna is also comparing health effects. One of the health benefits of sauna usage is the ability to sweat out toxins and purify the body. In fact, many people use infrared saunas as part of their body detoxification plan. The water to toxins ratio for the sweat released from using an infrared sauna is higher in the toxins released than a standard sauna. For infrared saunas it is 20% toxins while traditional saunas only release 3%. It is also believed that infrared saunas can cause a user to sweat three times more than when using a regular sauna. In fact, infrared heat is believed to be up to 7 times stronger at having the capability to purify the body of metals, cholesterols, alcohol, and nicotine, as well as many other types of harmful toxins the body is regularly exposed to and that are introduced into the body. 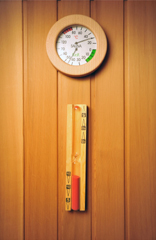 While heat and steam saunas do help with detoxification, the numbers are more impressive for the infrared sauna use. Sessions in infrared saunas can also last longer as the operating temperature is much lower in these than in regular saunas. Comparing infrared sauna vs traditional sauna from a cost perspective: A regular sauna can take up to an hour to heat up to a usable temperature, while an infrared sauna can be ready in less than half of that time. This enables users to not have to plan ahead as much in order to use their sauna. Assembly and set-up are also quite different in relation to the amount of time it takes to do so. While an infrared sauna can generally be put together in about an hour, it can depend on the type of infrared sauna kit you get. There are pre-cut and pre-built saunas, for example, and this can make a difference in assembly time. Yet, for traditional saunas, the modular version only takes an hour but the pre-cut or custom versions can take days or weeks. The electrical costs are also a big factor to evaluate and compare if you are considering adding either of these types of saunas to your home. While infrared saunas may cost as little as $10 extra dollars on your electricity bill per month, standard saunas can double your entire bill. This, obviously, is a huge factor to take into consideration if you do want to add a sauna to your home. There are other minor details that may differ between the two types of saunas, but these are some of the most common ones. These are all things you should know about and think about when trying to decide which option is best for an addition to your own home. If you’ve never tried an infrared sauna yet, you should make an appointment today and go see for yourself. Aside from just relaxing in the warmth of an infrared sauna, there are plenty of health benefits that make this a good choice to add to your life. To the top of "Infrared Sauna vs Traditional Sauna"